I am often asked about speeding up the leaf composting process by adding either fertiliser, as a nitrogen source, or a microbial compost starter. Neither are good ideas. Research on the biology of leaf decomposition has shown that the specific strains of fungi needed to start the rotting process are on the leaves before they fall from the trees. These fungi need only moisture and time to do their work, and might be set back by the introduction of alien microorganisms or chemical changes in their environment. 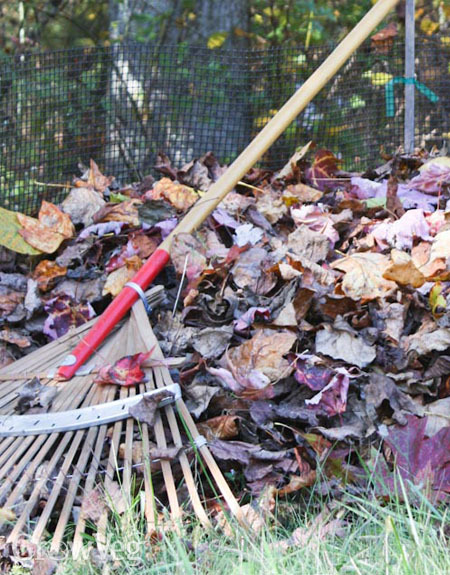 Once you hoard a quantity of leaves and have them contained, you can let them sit there until you find a good use for them. If I were more patient I might make a batch of true leaf mold, which takes two years in my climate. An ideal substitute for peat moss, leaf mold does a great job of retaining moisture and suppressing diseases in potting compost mixes, and it dramatically lightens up soil when dug into a garden bed. I used to have lots of it, thanks to neighbours who dumped their leaves in the woods every fall and forgot about them -- after letting the neighbourhood kids jump in the piles first.